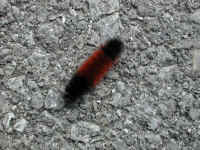 (Woolly Bear Caterpillar (Pyrrharctia isabella) - Isabella Tiger Moth Larva - 01) During late Summer and early Fall we often see Woolly Bear caterpillars crossing the road, which is characteristic of their species. It seems like we're constantly picking them up and placing them on the side of the road, as we did with this one. 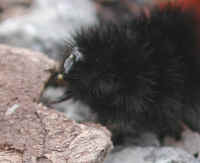 One of the interesting features of the woolly bears is that, as they mature, the black setae give way to the red-orange color of the thoracic segments (top of photo). 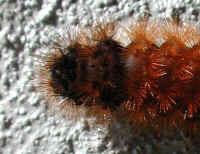 (Wooly Bear Caterpillar (Pyrrharctia isabella) - Isabella Tiger Moth Larva - 02) This top view of the previous Woolly Bear Caterpillar shows the red-orange setae more clearly. 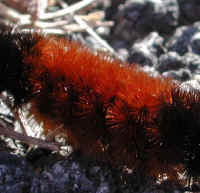 The coloration and width of the orange and black bands can vary considerably in different woolly bears. 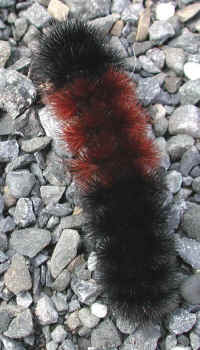 The actual side of the Woolly Bear is about 1-1/2 inches long. 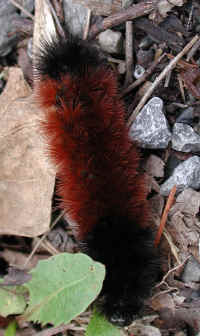 (Woolly Bear Caterpillar (Pyrrharctia isabella) - Isabella Tiger Moth Larva - 03) The setae, or hairs, of the Woolly Bear caterpillar are stiff and approximately the same length. (Woolly Bear Caterpillar (Pyrrharctia isabella) - Isabella Tiger Moth Larva - 04) We photographed this Woolly Bear caterpillar in late afternoon as the sun, low on the horizon, cast long shadows, even from such a small creature. 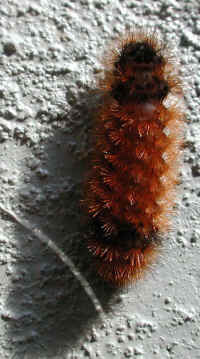 Note that all of the setae have turned red-orange, indicating that this is a mature caterpillar approaching the time to enter the pupa stage of his or her life. (Woolly Bear Caterpillar (Pyrrharctia isabella) - Isabella Tiger Moth Larva - 04a) The structure of the setae (hairy projections) can be clearly seen in this enlarged photo of the head end of this Woolly Bear caterpillar. 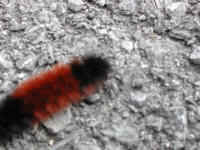 (Woolly Bear Caterpillar (Pyrrharctia isabella) - Isabella Tiger Moth Larva - 05) While we were taking a walk, Mary spotted this woolly bear caterpillar crossing the road and picked it up so it wouldn't be run over. 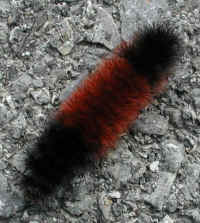 She placed it on these leaves on the side of the road that the woolly bear was heading toward. Sometimes they roll up into a ball, as this one did. (Woolly Bear Caterpillar (Pyrrharctia isabella) - Isabella Tiger Moth Larva - 06) When frightened, a woolly bear caterpillar will wind himself or herself tightly around his or her head, as this one has done. The head is hidden in the center of this coil. (Woolly Bear Caterpillar (Pyrrharctia isabella) - Isabella Tiger Moth Larva - 07) After this woolly bear sensed that the danger had passed, he or she uncoiled and resumed his or her trek again. Note that the long guard hairs that were visible in the previous two photos are no longer sticking up. 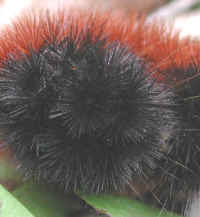 (Woolly Bear Caterpillar (Pyrrharctia isabella) - Isabella Tiger Moth Larva - 08) This photo gives us a close up view of the wooly bear's head. 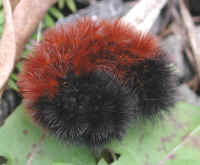 (Woolly Bear Caterpillar (Pyrrharctia isabella) - Isabella Tiger Moth Larva - 09) We bid the woolly bear farewell and offered a prayer for God's protection of this lovely fellow creature, as we each returned to our respective travels. 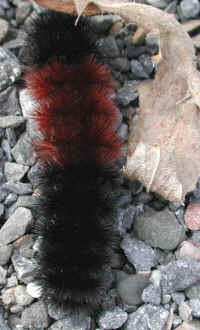 The head of the woolly bear is at the bottom of the picture. (Woolly Bear Caterpillar (Pyrrharctia isabella) - Isabella Tiger Moth Larva - 10) We spotted this woolly bear on the edge of the road. The unusual "saddle" pattern of orange-colored bristles caught our attention. (Woolly Bear Caterpillar (Pyrrharctia isabella) - Isabella Tiger Moth Larva - 10a) In this photo, we get a closer look at this unusual, orange color pattern on the back of this woolly bear. Usually, the coloration is in bands that wrap around the body. (Woolly Bear Caterpillar (Pyrrharctia isabella) - Isabella Tiger Moth Larva - 11) The woolly bear continued his or her walk into the grass on the side of the road. (Woolly Bear Caterpillar (Pyrrharctia isabella) - Isabella Tiger Moth Larva - 12) This woolly bear was holding on to this plant stem while he or she was busily eating away the top. 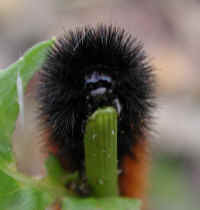 (Woolly Bear Caterpillar (Pyrrharctia isabella) - Isabella Tiger Moth Larva - 13) In this photo, we can see the woolly bear eating the top of this plant stem. 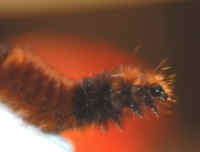 (Woolly Bear Caterpillar (Pyrrharctia isabella) - Isabella Tiger Moth Larva - 14) A woolly bear came to visit Kay Deckman, and she kindly sent us this photo to share with our visitors. (Woolly Bear Caterpillar (Pyrrharctia isabella) - Isabella Tiger Moth Larva - 15) A woolly bear came to visit Kay Deckman, and she kindly sent us this photo to share with our visitors. (Woolly Bear Caterpillar (Pyrrharctia isabella) - Isabella Tiger Moth Larva - 16) A woolly bear came to visit Kay Deckman, and she kindly sent us this photo to share with our visitors. (Woolly Bear Caterpillar (Pyrrharctia isabella) - Isabella Tiger Moth Larva - 17) A woolly bear came to visit Kay Deckman, and she kindly sent us this photo to share with our visitors. (Woolly Bear Caterpillar (Pyrrharctia isabella) - Isabella Tiger Moth Larva - 18) A woolly bear came to visit Kay Deckman, and she kindly sent us this photo to share with our visitors. (Woolly Bear Caterpillar (Pyrrharctia isabella) - Isabella Tiger Moth Larva - 19) The most common place we see woolly bears is when they're crossing the road. It is also very dangerous for them, as a lot of them don't make it to the other side. If we see a woolly bear on the road while on one of our walks, Mary always runs ahead and picks them up and puts them on the other side of the road. 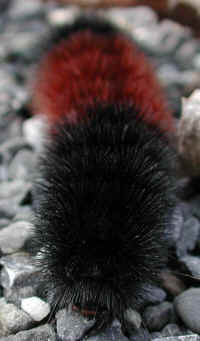 (Woolly Bear Caterpillar (Pyrrharctia isabella) - Isabella Tiger Moth Larva - 19a) This is a closer look at the woolly bear crossing the road. (Woolly Bear Caterpillar (Pyrrharctia isabella) - Isabella Tiger Moth Larva - 20) Sometimes the woolly bears move so fast that's it hard to get a clear photo. 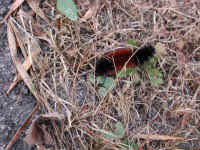 (Woolly Bear Caterpillar (Pyrrharctia isabella) - Isabella Tiger Moth Larva - 21) We protected this woolly bear until he or she crossed the road and went into the grass on the other side. (Woolly Bear Caterpillar (Pyrrharctia isabella) - Isabella Tiger Moth Larva - 21a) This is a closer look at the woolly bear in the grass.